One day I was working on an old first generation Agilent Infiniium oscilloscope (namely 54810A) while I was too tired and rushed, I accidentally short-circuited the main acquisition board because I forgot to reconnect the probe-compensation port pin back to the acquisition board after taking out the front-panel and putting it back: the jumper with exposed metal (the heat-shrink over it was a little short the way Agilent manufactured them) swiped over something and I heard a loud bang, the scope shuts off, and I smelled the magic smoke. My heart sank. Just saving a few extra minutes being careful checking everything (despite I opened and closed those front panel ten dozen times) I thought I lost an expensive PCB that’s almost the cost of the whole oscilloscope, and even if I can fix it, it might drain me at least a week. Given that I know a short fried something (there’s a bad smell). I didn’t even bother to turn the unit on again until I’ve located what fried. Turning something that you know it’s fried on again just risks further damage as it can load other parts of circuits. 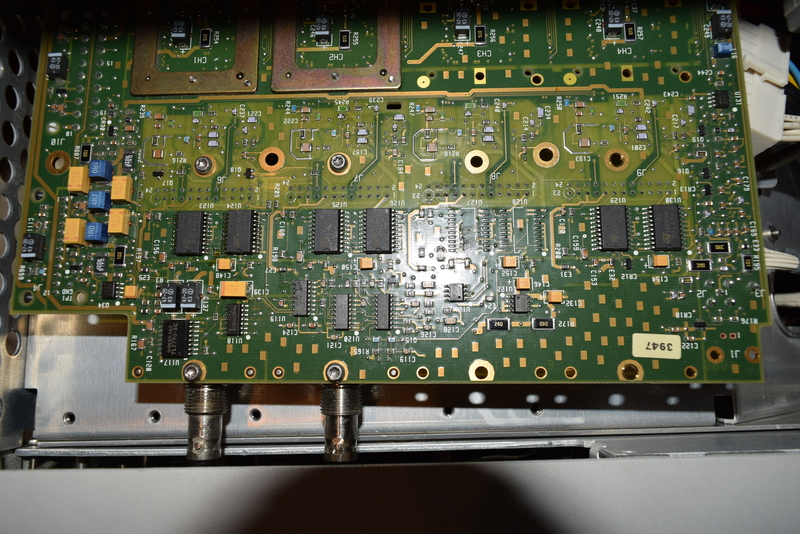 Following the smell, I found a burnt IC on the other side of the board (needs to be painfully disassembled as the front panel /w BNC nuts needs to be taken out all over again), and I looked up the part number: ST L6201. It’s sitting on Channel 1’s front end section between the attenuator relay block and the ADC hybrid and there are 2 of them per channel. What is an H-bridge driver (L6201), that’s supposed to control motors, doing in an oscilloscope, especially the front-end section? I googled “H-bridge driver in oscilloscope” and nothing relevant turned up. Then I went back and read a little more on how an H-bridge driver is really used. L6201 is a DMOS Full Bridge Driver with four power MOSFETs (switches) that basically sends current through an inductive load (typically motor) that might have stored energy (momentum) that might need to be drained (brake) to stop faster. I also noticed, while dealing with the main acquisition board for 54615B/54616B, there is a L293D chip under the attenuator block shield for each channel. It’s a 4 channel driver with half-bridge, also intended to drive inductive loads. This one is more explicit about being used to drive relay solenoids as well as motors. So this is nothing new; It’s just not too many people talked about using it on oscilloscope architectures.